It isn’t only the cathedrals that lead our souls to the sublime; it is also the restaurants. On the other hand, sometimes the toilet facilities lead to the ridiculous. Three vignettes. 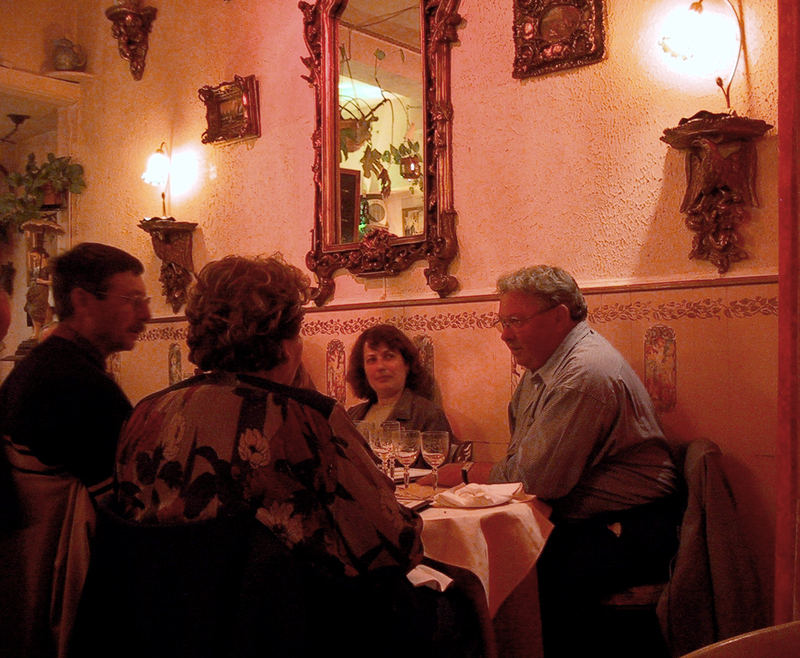 Unless you have experienced it, there is no way you can understand French restaurants and food. I can tell you that it is good, but that doesn’t do justice to the art of the cuisine. And it is an art. Not just of preparation, but of presentation, as well. 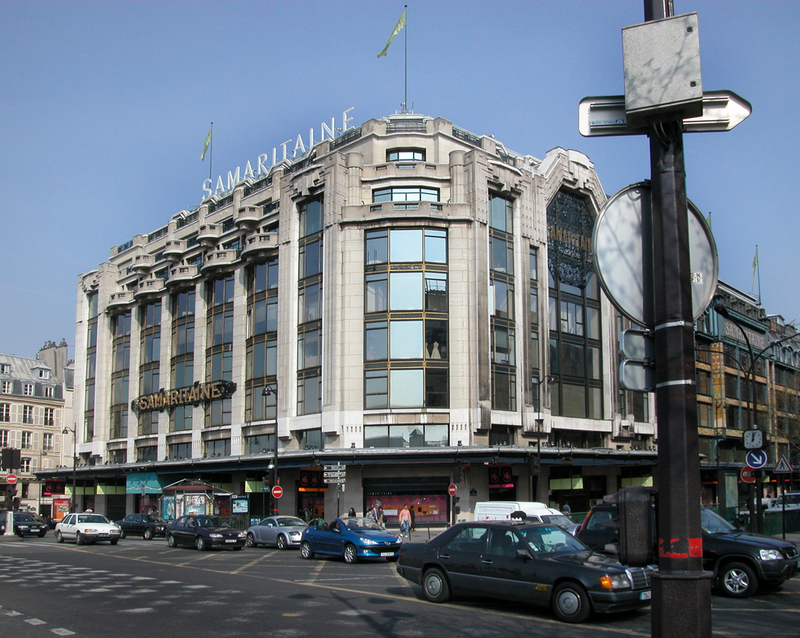 We spent most of today shopping at Samaritaine, trying to get a few souvenirs to bring home to friends and loved ones. We stopped for lunch again at Toupary, the fifth-floor restaurant at the department store. We had a chunk of salmon on a bed of cabbage, covered in a bacon and cream sauce, that was exquisite. There are no words to describe the complexity of the flavors, and how well balanced they are. But that takes second place to the dinner at Chez Alexis et Daniel tonight. It is a little hole in the wall right across the street from our hotel. We hadn’t gone there before because it hadn’t been open. But tonight it was and we walked over. Inside, it is all tarted up with mirrors, putti, fringe, and red-filtered lights. 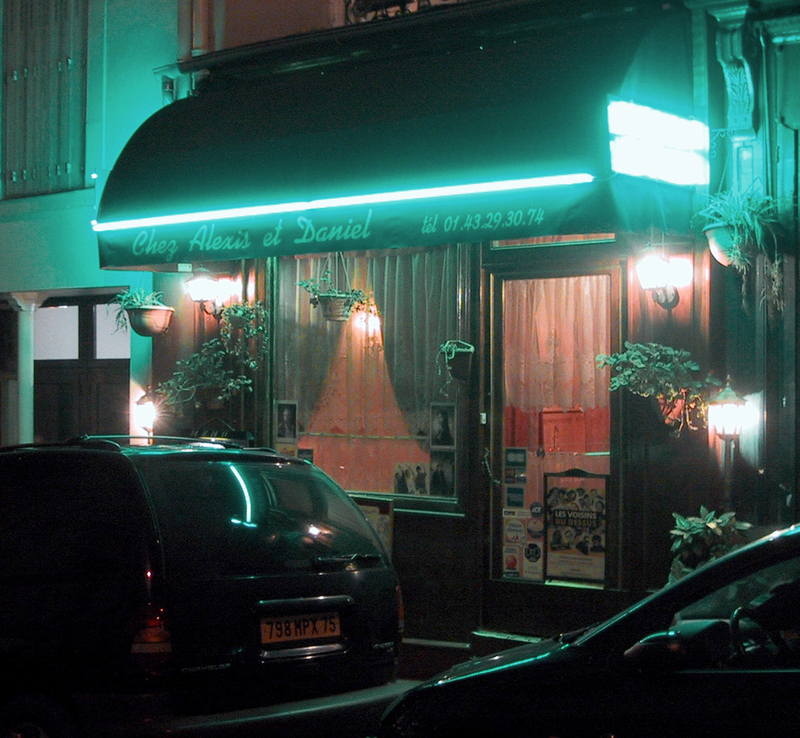 We had our only “bad” experience at a brasserie that catered to tourists. (The food was just fine, but we have come to expect magnificent, and just “fine” seemed like a total failure). And Chez Alexis et Daniel has a menu posted outside in English. We were suspicious. But the items on the menu were too seductive to pass up, so we went in anyway. There were perhaps six or seven tables in the place, each about 2 foot square. A big mirror in a baroque frame hung on one wall. 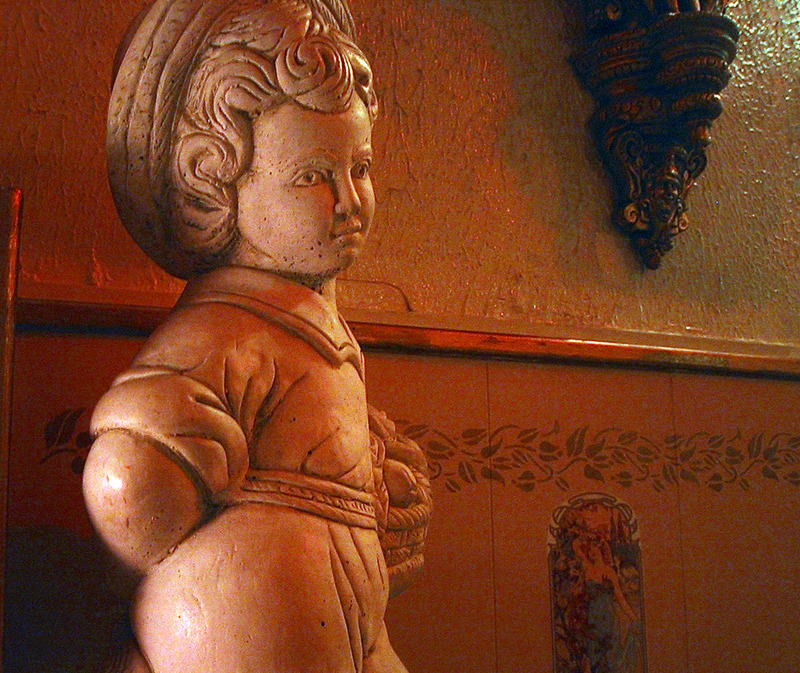 A plaster boy with big hips and bare feet stood on the remnants of a fluted column in the corner. Every item on the list seemed fantastic. There was foie gras, goat cheese, pears, exotic mushrooms, snails, scampi and lamb. 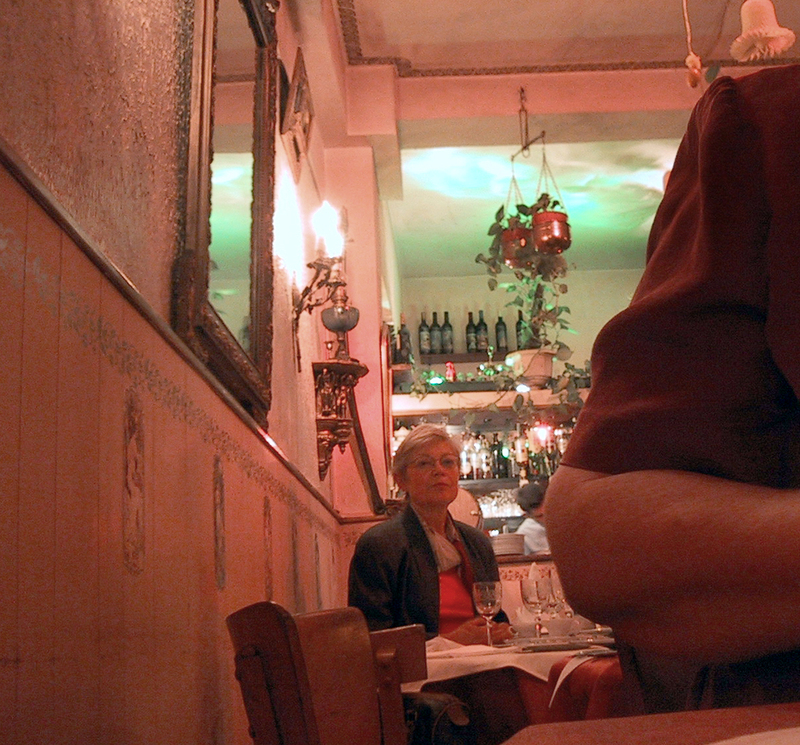 There were three “menus:” one for €15.95, one for €19.95 and the most elaborate for €24.95. In each, diners had their choice of entree (first course), plat (main course) and dessert. Carole ordered a chicken liver pate for her entree, with onion confit. When it came, it was the size of an American serving of meat loaf. Richard ordered grilled goat cheese with mixed greens. One bite, and I knew, this was not like the other restaurant. This was Beatrice pointing the way to Dante. This was the gates of heaven being thrown open and the light streaming through. For her plat, Carole had a rump steak in poivre sauce. Richard had a beef rib with foie gras and poivre sauce. Both came with cubed fried potatoes. But who could eat the potatoes? The beef rib was so big, and after an entree the size of most whole dinners, one had to conserve space for the impending dessert. The L-tryptophan kicked in, the seratonin flowed like a water hose and the melatonin gushed like a geyser. I sat with a goofy grin on my face and lost the use of my mother language. All the while, a tiny dog with skinny legs wandered around from table to table looking for a little loving. We waddled back across the street to the hotel knowing that the promise of Christian salvation has little value compared with the presence of a good French meal. I would like to entitle this essay, les toilettes du Paris. 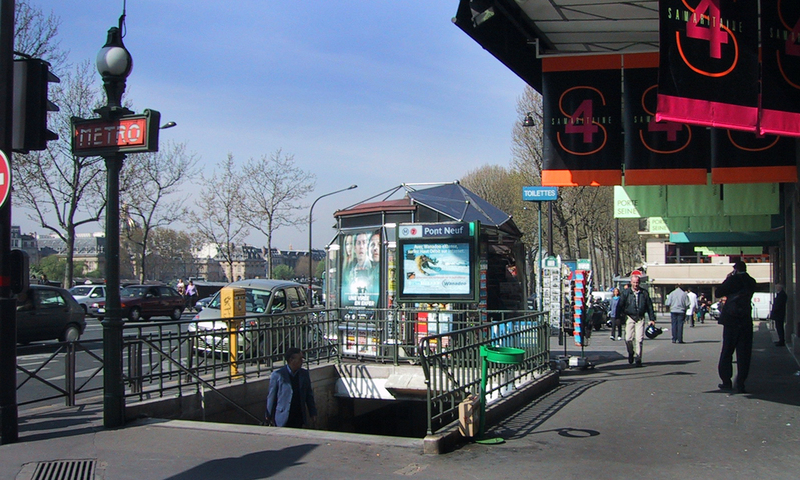 One approaches une toilette dan Paris with trepidation. Because one does not know how much it may cost, or how to get in, and after one does get in, how to negotiate the flushing mechanism and how to get out. Nine times out of ten, the light, which is inside the cubicle, shorts out while one is engaged. The toilet papers are most unusual and varied in color from newspaper gray to dusty liver. The lavatories are sometimes in the cubicle, and when they are, they come out from the wall just a smidgen more than the length of my hand. They are totally cool and I wish I had one. One never knows what device one will encounter for flushing. The most frightening ones make an alarming rushing sound on their own when one least expects it. The others flush with buttons on the wall, buttons on the top of the back of the toilet, a pedal on the floor, or a chain hanging down from the ceiling. 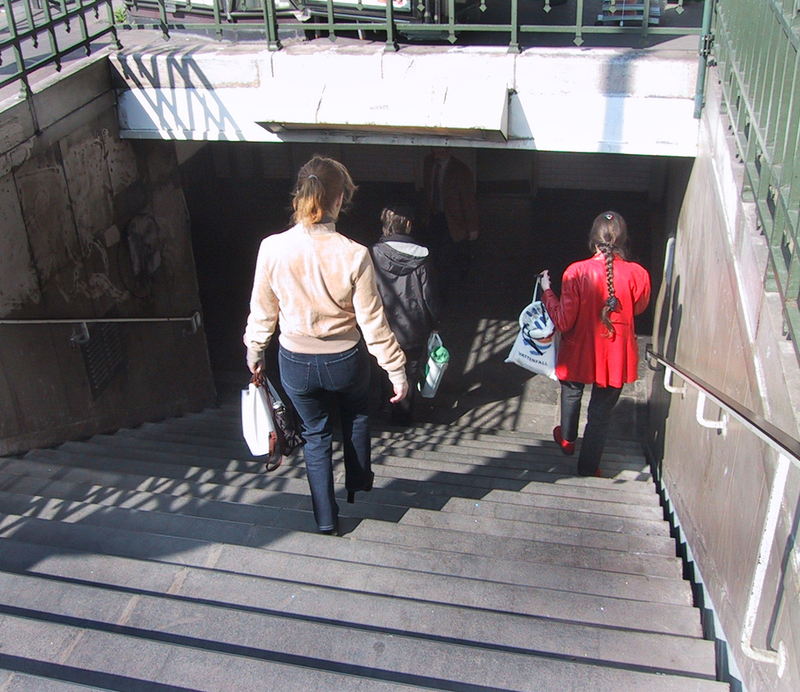 My most amazing urinary experience so far, was underground at the metro stop in front of Samaritaine, in a beautifully paneled labyrinth. There were about 10 stalls, some with doors, some without, all within view of each other. Men and women integrated, not separated at all. One could pay 38 cents and relieve oneself before god and man with no door at all, or one could pay 50 cents and have a door. I paid my money to a little Chinese woman (the hostess) and she was chopping onions, right there in the middle of the bathroom. As I departed, she had begun rolling these chopped onions into some kind of rice balls which I pray to god she was not prepared to sell to bathroom customers. I have so much experience in these matters because I seem to have picked up a bit of a urinary tract infection. I have averaged going to these toilettes 10 times a day, when I can find them but I believe I have experienced a Catholic miracle, because yesterday, I gave money to beggars all day and I’m getting well. 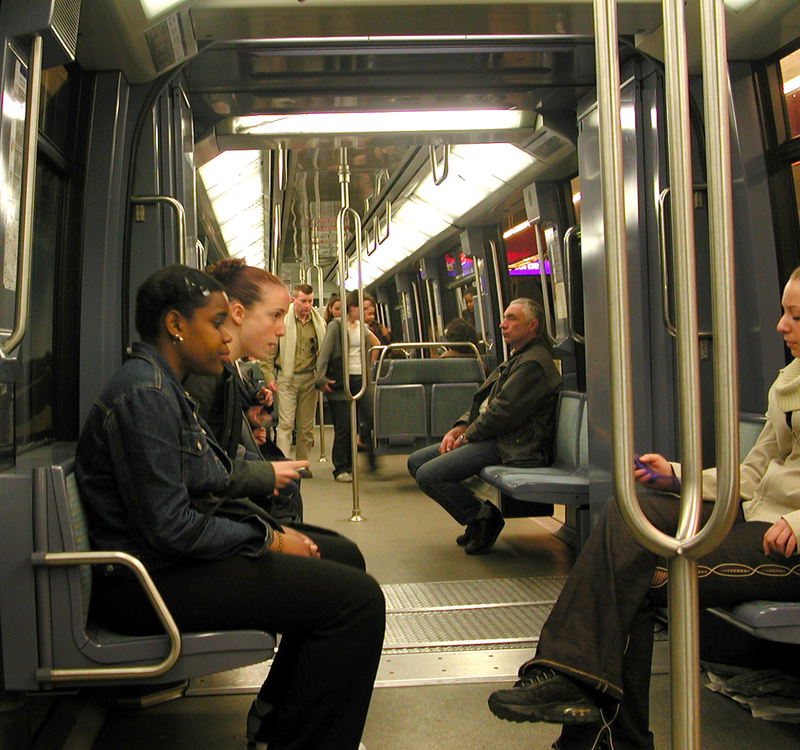 It has become a regular thing on the metro for a group to jump on the train with accordions or guitars and start playing music with a little tin cup or a hat to collect donations. There is little more annoying than accordion music on a subway, but today, at one stop, two accordions got on at once, accompanied by a woman with a tambourine. There is a good deal of begging in the subways. Much of it includes music, either a violin or guitar. One black woman at the Odeon stop today was singing a beautiful, bell-clear soprano. It was a cross between plain song and something operatic. She rapped a small tuning fork in her hand periodically to keep on pitch. Whether she needed the help, I don’t know, but her voice was angelic. Carole gave her money. Carole has been giving money right and left these past few days. She is a sucker for a beggar. I know they can see her coming up Sixth Avenue like a parade float. 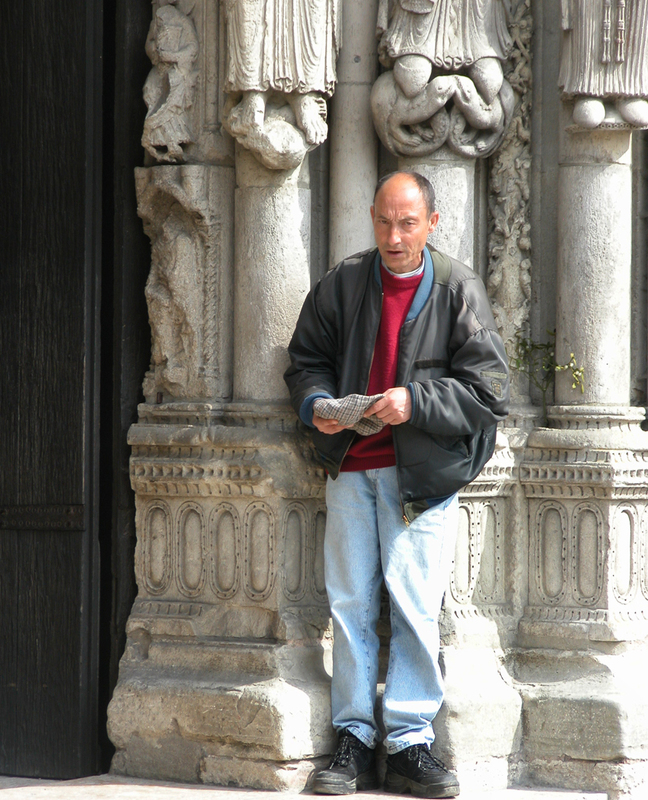 The championship beggar was the man at the entrance to the Chartres cathedral who was singing “Nobody knows the trouble I’ve seen, Hallelujah, Hallelujah.” It was a bizarre macaronic song, made up of bits of familiar tunes and words, but all jumbled up. And he kept repeating it over and over, hat in hand, waiting for people to drop him a Euro or two. He snookered Carole when she went to give him some money. He had a little plastic cup with a lot of American change in it, but told Carole that he had trouble changing the coins for Euros, and would Carole consider giving him a substantial donation in Euros in return for the pile of nickels, dimes and quarters. Well, Carole only had a 20 Euro note, and that was too much. So the guy took her to the toilette, where an attendant changes bills for coins so people can use the pay toilets. But the woman there refused to change the bill for Carole (perhaps she knew what the guy was up to), so they went to the gift shop, where Carole bought some bijoux or other and with the change, gave the guy a 5 Euro note in exchange for about 3 pounds of American metal. It weighed down her handbag for the rest of the day. “That cured me of giving money to beggars,” she said, but experience has proved otherwise. She still stops, even when our train is in the station and we need to move expeditiously, and scours her handbag for something to give to the beggar. I met this beggar too, 12 or 13 years ago. Collecting coins in a seashell, standing at the entrance singing. I sat to listen to him, which he noticed, and tried talking to him in English. He sang for me “When the saints go marching in” mixed with “Go down Moses”. Just found your blog and enjoying it, thanks.